Advanced Data Formatting permits acquired data to be manipulated based on its contents and/or custom rules configured to trigger (or prevent) actions based on specific criteria. For example, a simple rule can move the cursor ahead four characters or from one text field to another. A complex rule might be created to trigger an action only if the first four digits of an acquired 16-digit number match those of a specific bank. Any number of rules and interdependencies can be created, giving DataWedge the ability to suit virtually any data processing requirement. Advanced Data Formatting features are implemented through Rules, Criteria and Actions. The containers for one or more processing Actions and the user-definable criteria that trigger Action(s). All DataWedge Output Plug-ins can contain one or more ADF rules for the processing of acquired data. The triggers for taking a processing Action. Criteria can be set according to input type (i.e. 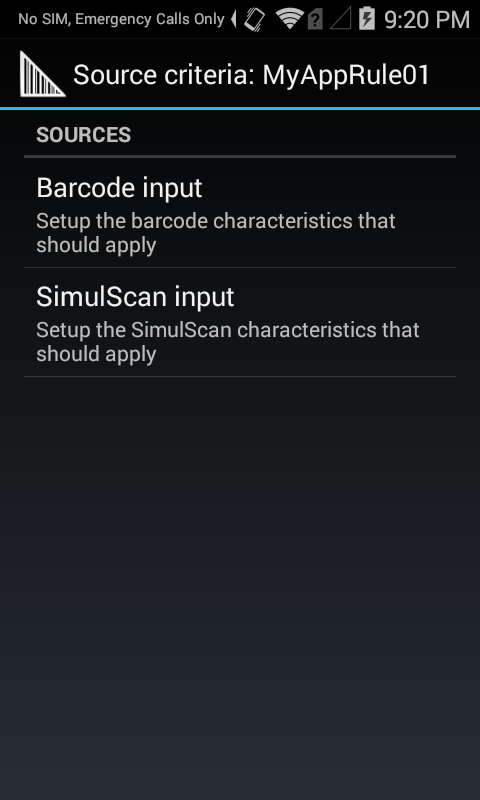 only data from a barcode scanner), Symbology (i.e. only Code39 data), and a specified string within the data (at a specified position in the data string and/or of a specified length). Acquired data not matching all defined criteria will not trigger Action(s). Any or all of the supported barcode types can be selected or excluded. A set of procedures for analyzing, identifying and processing acquired data. These steps are all carried out within the Advanced Data Formatting Process Plug-in, which is part of every DataWedge Output Plug-in. For further details, see the Plug-ins section of the DataWedge Setup Guide. 1. 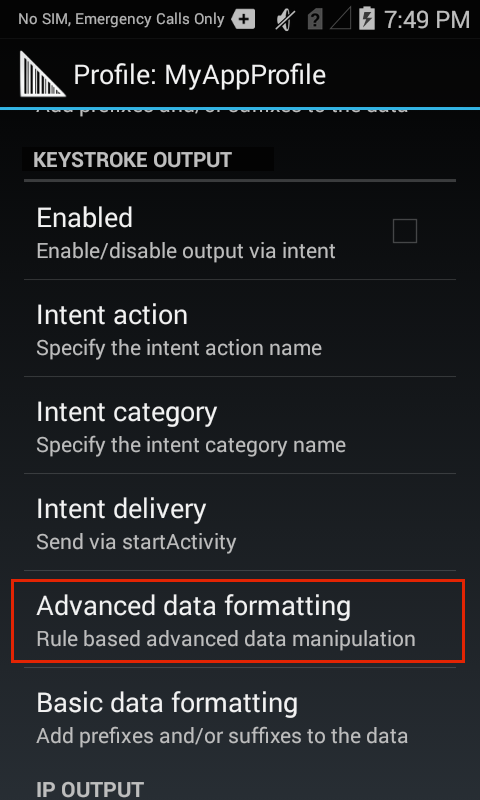 In the Profile that requires ADF, tap on Advanced data formatting as highlighted below. A screen appears similar to the image in Step 2. 2. 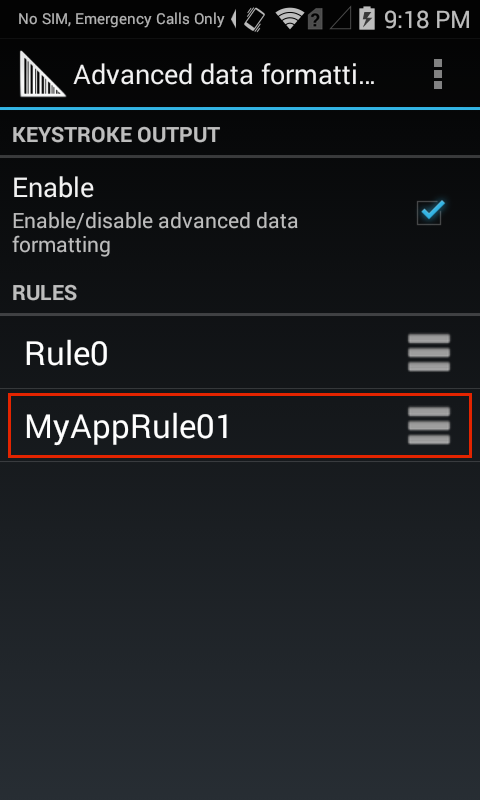 Tap the "hamburger" menu, select New rule and enter a name for the rule. The new Rule appears with other Rules in the Output Plug-in screen similar to the image in Step 3, below. 3. Tap the new Rule to access its settings. A screen appears similar to the image in Step 4. 4. Tap Criteria as highlighted below to enter the criteria that will activate the Rule. 5. 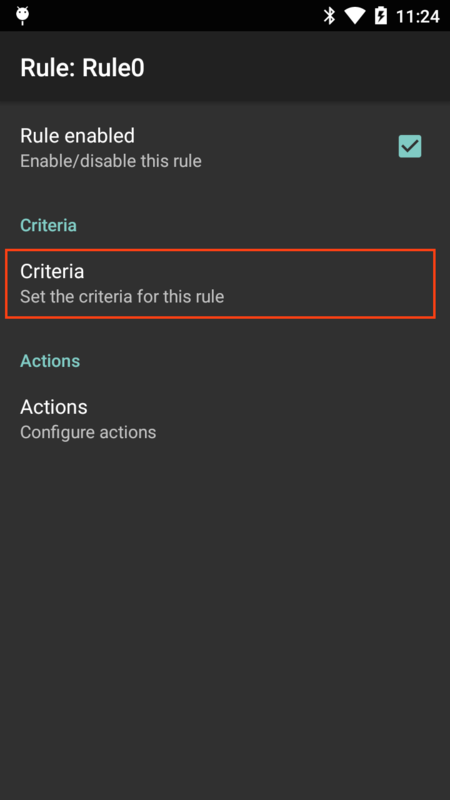 From the Criteria screen, enter the criteria that will activate the Rule based on the options below. x - checks for the character "x"
String position - The starting position (starting at 0) at which to check for the string specified in the "String to check for" parameter. For example, the target string "AB" with a string position of 3 would invoke action(s) if the string "123ABC123" is acquired, but would not invoke action if the "AB" was located anywhere else in the string (or was not present). Notice that the "AB" portion of the example string begins at the fourth character from the left, which is position 3 when starting the count from 0. String length - An optional parameter that allows a specific length (in characters) to be present before action(s) will be invoked. For example, if scanning U.S. Social Security numbers, a String length of nine (9) might be used as a means of initial validation. Source criteria - An optional parameter that can invoke action(s) only when data is acquired by means of a barcode scanner (through which specific decoders can be further selected or excluded), or through SimulScan. 6. Tap the BACK button to save and return to the Rule screen. 7. 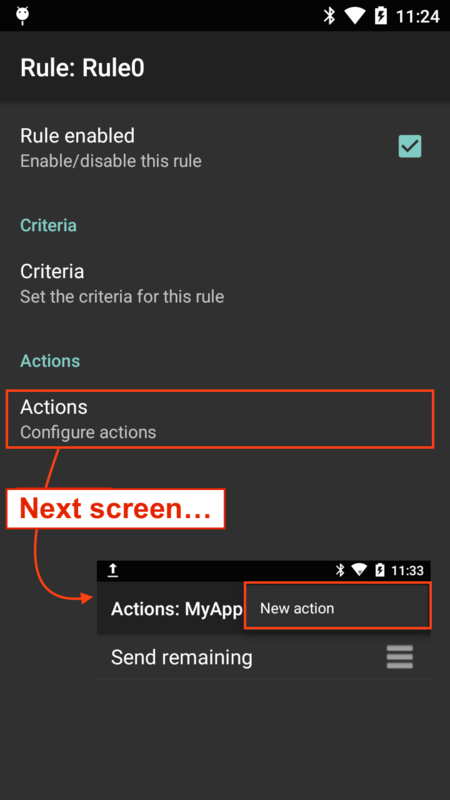 From the Rule screen, tap "Actions" as highlighted below. Then select New action from the menu on the next screen. A scrollable list of Actions appears, similar to the image in Step 8. 8. Tap the desired Action in the Actions list, scrolling as necessary. 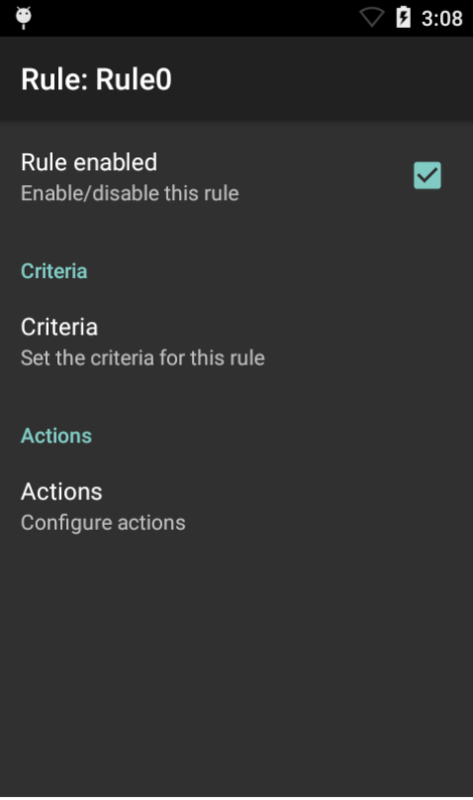 After tapping an Action, the Rule screen reappears with that Action added to the bottom of the Actions list. For a description of each Action, see the table below. Moves the cursor forward by the specified number of characters. Moves the cursor back by the specified number of characters. Moves the cursor to the beginning of the data. Moves the cursor forward until the string specified in the data field is found. Moves the cursor forward past the string specified in the data field. Reduce spaces between words to one and remove all spaces at the beginning and end of the data. Disables the last Crunch spaces action. Remove all spaces in the data. Disables the last Remove all spaces action. Remove all zeros at the beginning of data. 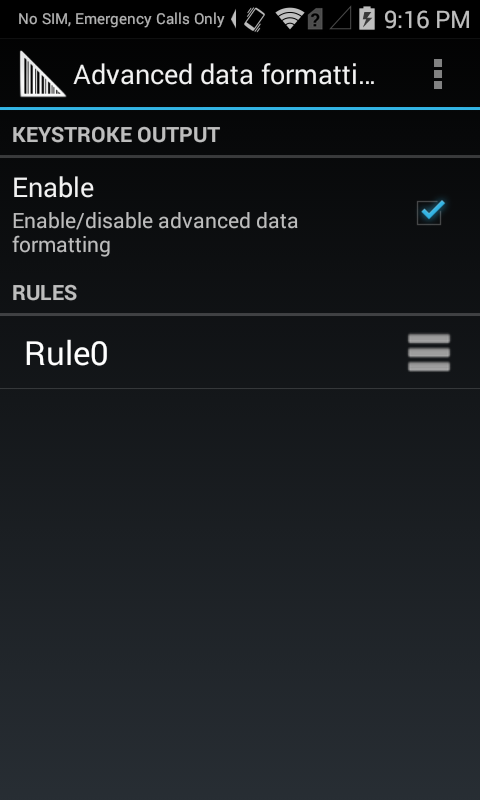 Disables the previous Remove leading zeros action. Left-pad data with the specified number of zeros. 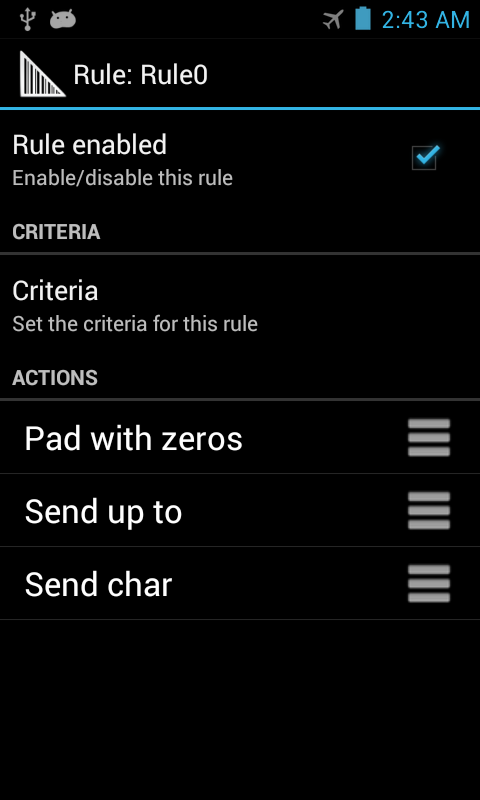 Disables the previous Pad with zeros action. Replaces a specified string with a new specified string. Both must be specified. Stop all Replace string actions. Remove the number of characters specified in given positions when send actions are executed. Stops removing characters from subsequent send actions. Sends the specified number of characters from the current cursor position. Sends all data that remains from the current cursor position. Sends all data up to the specified string. Pauses the specified number of milliseconds (default = 0; max. = 1000) before executing the next action. Zebra recommends pausing 50 ms after sending any ENTER, LINE FEED or TAB character. Sends the specified ASCII/ Unicode character. The maximum Unicode character value can be entered is U-10FFFF (= 1114111 in decimal). Note: To help minimize data loss, Zebra recommends sending a Pause Action of 50 ms after sending any ENTER, LINE FEED or TAB character. 9. Repeat Step 8 until all required Actions appear in an Actions list similar to the image below. Actions execute from top to bottom. To re-order an Action, drag by its "hamburger" icon. See additional notes and the example, below. The ADF Rule screen from DataWedge 6.2 (with several configured actions). The ADF Rule screen from DataWedge 6.2 (with no configured actions). Actions are processed from the top of the list downward to the bottom. To reposition an Action, drag the Action by its handle (to the right of its name). 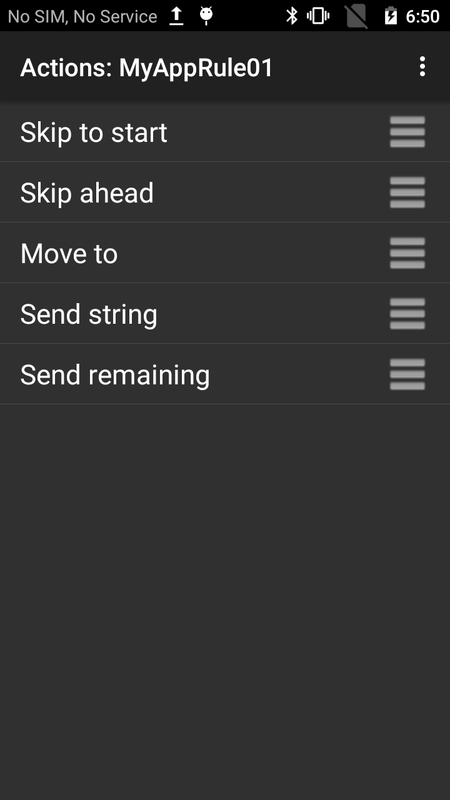 To delete an Action, long-press the Action name. A Pause Action of 50 ms after sending ENTER, LINE FEED or TAB Actions can help minimize data loss. Once a Rule is enabled (with a check mark in its Rule screen), a Rule will apply whenever its parent Profile is used. All data acquired through the Profile will be processed according to the Actions defined in the Rule before being transferred to the selected Output Plug-in. If no ADF rule is enabled or defined, DataWedge passes decoded data to the Output Plug-in without processing. When setting up an ADF data processing rule to find or replace control characters, extended ASCII characters or other non-printable characters, DataWedge supports the use of the \xNN notation to specify hex value of the character and \uNNNN notation for Unicode values. The following is an example of the creation process for an Advanced Data Formatting Rule that might be typical for data processing scenarios. Tap HOME -> DataWedge -> Profile0. Tap String to check for. In the text box, enter "129" and Tap OK. Tap String position. Change value to 0 and Tap OK. Tap String length. Change value to 12 and Tap OK. Tap All decoders enabled to uncheck and disable all decoders. 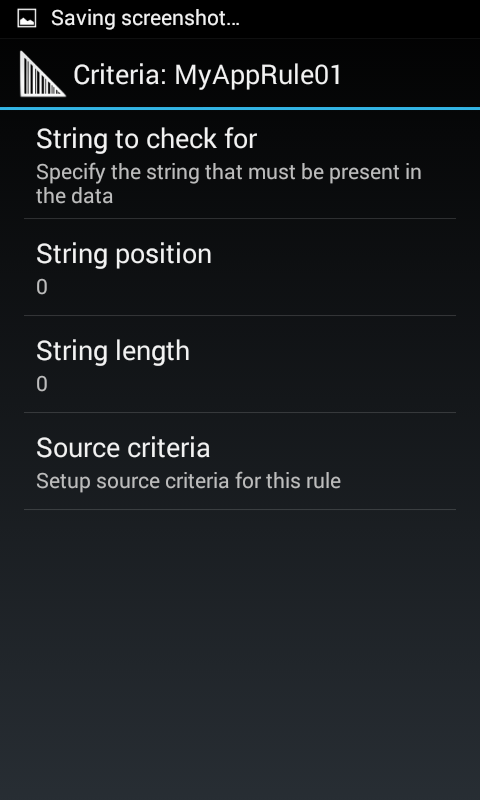 Tap Code39 to enable the Code39 decoder only. Under Actions, tap and hold Send remaining until a menu appears. Tap Menu -> New action. Select Pad with zeros. The Pad with zeros Action appears in the Actions list. Tap the Pad with zeros Action. Tap How many. Change value to 8 and Tap OK. Tap Menu -> New action. Select Send up to. The Send up to Action appears in the Action list. Tap the Send up to Action. Tap String. In the text box, enter "X" and Tap OK. Tap Menu -> New action. Select Send char. 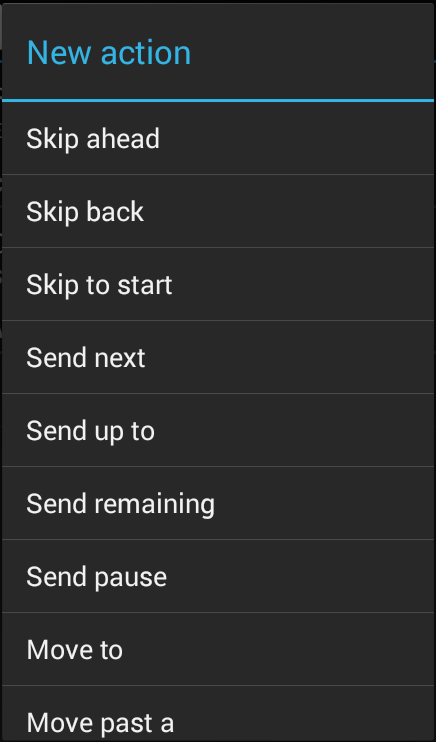 The Send char Action appears in the Action list. Tap the Send char Action. Tap Character code. In the text box, enter 32 and Tap OK. The Rule0 screen should appear similar to the image below.